Ronnie Montrose came with a strong rock pedigree, having started off as a session musician for top artists such as Van Morrison, then becoming a member of the Edgar Winter Group, and by 1974 he was fronting the great Montrose along with Sammy Hagar. I saw Montrose twice; once as support for Status Quo, and around the same time as the opening act at the Who’s 1974 Charlton gig. They were amazing; full-on rock with two classic tracks: Bad Motor Scooter, and Space Station No 5. By 1981 Sammy Hagar was fronting his own band, and Ronnie Montrose was leading Gamma alongside Glasgow-born singer Davey Pattison. 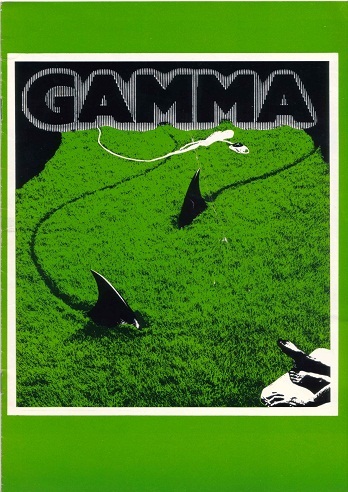 Gamma arrived to tour the UK at the time of the emergence of the NWOBHM (New Wave Of British Heavy Metal), and support act for the concerts was NWOBHM band Praying Mantis. 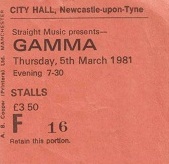 In the tour programme Ronnie Montrose describes Gamma as a “full-blown, high energy rock ‘n’ roll band” and that is exactly my memory of this gig at Newcastle City Hall. Some classic, loud, heavy rock and the bonus of Montrose classics Bad Motor Scooter, and Space Station No 5. I was sitting close to the front, and they were LOUD. The gig was not that well attended, as I recall, which was a shame, as they were a pretty hot rock act. Ronnie Montrose sadly died from a self-inflicted gunshot wound in 2012; he had been battling prostate cancer. I didn’t realise it until I checked things out for this blog, but I saw singer Davey Pattison a few years ago as the singer in Robin Trower’s band. My searching for Gamma facts also unearthed a setlist for the Birmingham gig of the tour: Ready for Action; Thunder and Lightning; Dirty City; Razor King; Space Station No 5; Skin and Bone; Rock The Nation; I Got The Fire; Voyager; Four Horseman; Mayday; Mean Streak; Something in the Air. Encore: No Tears; Bad Motor Scooter.